Summary: Liyana has trained her entire life to be the vessel of a goddess. The goddess will inhabit Liyana’s body and use magic to bring rain to the desert. But Liyana’s goddess never comes. Abandoned by her angry tribe, Liyana expects to die in the desert. Until a boy walks out of the dust in search of her. 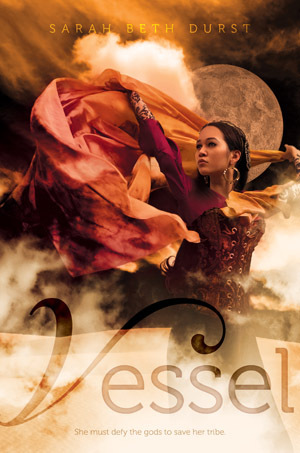 Review: I thoroughly enjoyed Vessel, and that was largely due to the world building and Liyana. Durst did an excellent job of creating a desert-dwelling culture, and the book was sprinkled with fun details about the tents, clothing, animals, critters, and food. (I will admit that the food wasn’t always fun, but I suppose eating snakes is a better alternative to starving.) This attention to detail—from the embroidery on Liyana’s dress to the preparations our heroes take for incoming sandstorms—grounds the world and makes it feel lived in. This is especially helpful since there’s a bunch of mystical stuff going on. In addition to Korbyn, the tribes have magicians of their own, and this world is one filled with wolves made of sand, dragons made of not-actually-glass, monstrous silkworms, and the Dreaming (afterlife/world of gods). Some of these mystical elements and their impact on the plot are more fuzzy/arbitrary than I’d like, but I could accept them. Liyana and Korbyn, and even the Emperor to some extent, make the world even richer through the sharing of fairytale-esque stories (which, since this is a fantasy book, are not entirely made up). Many of the stories are about the desert gods, but some are about the empire’s gods or even mortals. Some of them were pure indulgence; others revealed characters, world building, or history; and yet others were used by the characters to teach or debate within the book. I loved these stories. Durst spends a lot of time on the nature of the vessels and their sacrifice, and these moments are particularly poignant. Some vessels are fanatically devoted to their god and their tribe; others are terrified and don’t want to die. Liyana falls along “the needs of the many outweigh the needs of the few” line—she’s not thrilled to die, but she knows that her tribe needs her goddess, Beyla, in order to survive the Great Drought. It’s particularly wrenching when Liyana says goodbye to her family or whenever she thinks about the extra time she’s been given only because her goddess has disappeared. I have one major complaint about the book, and that would be the last moment romantic rival—and it’s not even really a rivalry as Durst avoids any competition/jealousy between the boys. Much of the book is devoted to the kind-of-sort-of-not-vocalized romance between Liyana and Korbyn. (Things are complicated—Korbyn is Beyla’s lover, but a mutual attraction between him and Liyana grows over the course of the book.) I was taken by surprise when a certain character expressed interest in Liyana, though that plotline won me over by the end due to a combination of 1) already enjoying that character and 2) the sheer practicality of it all. Recommendation: Get it soon. Liyana, Korbyn, and the other main characters are an enjoyable and complicated ensemble, and the world they inhabit is as magical as it is dangerous. I loved the world, and the story was a solid quest with fun characters, lots of peril, a not-too-angsty romance, and occasional armies.